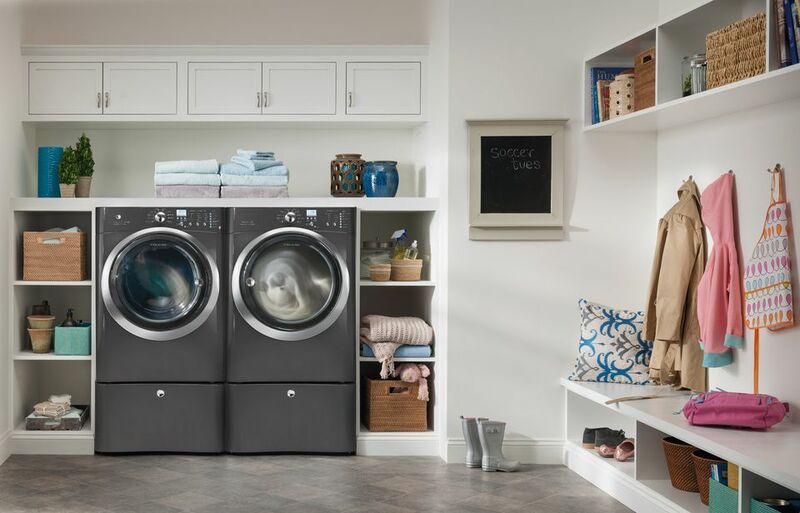 The laundry room probably isn't your favorite part of your house, but if you have a family you likely find yourself spending time in it more often than you'd like. So why not make it a room you enjoy visiting, to the point where - gasp - you might even look forward to your next load of laundry? These totally cool, totally beautiful ideas span from super easy to some-renovation-required, but they're all gorgeous enough to make your friends jealous. Just prepare for guests to bring their dirty laundry over each time they visit. The first step to any practical laundry room is a sink; this simple addition will pay off time and time again. The farmhouse sink is both trendy and practical, lending a vintage vibe in any room. The deep basin is perfect for your laundry room, especially if you have a lot of delicates, and if white isn't your style you can find a farmhouse sink in many different materials to fit your look. Add in the subway tile and the gorgeous gold fixtures, and this laundry room steals the show. If you don't have a totally separate space to do laundry, never fear. Just because your washer and dryer are in a closet doesn't mean you have to settle for a boring wood door. This easy-to-install barn door is a stunner, and adds a stylish-yet-rustic look without a lot of effort. This is a great idea if your laundry area is in a main room, such as a bedroom or a living space. Here's another idea for those of us who don't have 500 square-foot rooms to dedicate to cleaning our clothes. This cute idea takes little to no work - simply install a reclaimed wood shelf, add some matching baskets to stay organized, and your little laundry nook instantly becomes a little brighter. Even if you can't afford to upgrade your appliances, a simple makeover can make the area feel less outdated. Adding a few cute accessories (such as this lamp) if you can spare the space is a great way to add some warmth. This one is for the dreamers out there. This large, natural light-filled space is only for those of us who have the room to spare, but it sure is stunning. This is a great idea to combine with a mudroom – we love the nooks for coats, shoes, and firewood. Making your laundry room a multitasking space will help it feel less isolating, and if you've got that natural light it's a great way to open up the space. Rustic is in, and we adore this quaint little laundry room look. Adding old cabinets from a recent renovation or a flea market is a great way to stay organized in your laundry room. Keeping a clutter-free space in this room is key, since no one wants to do chores in a room begging for a deep clean. We love the Americana country feel of this room. Subway tile, unfinished wood and Turkish prints are all big right now, but if you tend to shy away from trends, a laundry room is a great way to get your feet wet. The wood machine cover adds instant utility that's both pretty and useful and the graphic rug adds a bit of personality to the space. Don't forget to add a few fun laundry gadgets to make the task even easier. We absolutely love this dog-lovers laundry room trend. If you're totally renovating your space and your house has more canines than humans, adding a dog wash is a wonderful idea that will make life so much easier. Imagine the days of convincing Fido to get into your bathtub without getting water everywhere are over. This dog wash also doubles as a foot or shoe wash for muddy days. The best way to enjoy using your laundry room is to ensure it stays tidy and organized. We have some tips to help you get there, but designing your space with organization in mind is a great way to ensure you stay on top of it. Adding shelves and matching containers to hold laundry detergent and dryer sheets will go a long way. Getting kids to participate in chores without constant reminders can be tough, but adding a chalkboard to your laundry room can help send some gentle reminders. It's also a great way to remind yourself of which clothes can't be dried (who hasn't ruined a fancy dress or two? ), or simply of tasks that should be done this week. You can even DIY this one. We also love the laundry basket shelf in this room; it's a great way to keep every member of the house's belongings in order. Mid-century design is a very stylish way to make a space feel open and trendy. We love these bamboo, retro-inspired laundry room doors. If barn doors aren't your thing, these add privacy while giving off a cool Palm Springs vibe. This is a wonderful idea for a laundry room you can't fit in a basement or a closet. Bonus points if you can do laundry outside all year long like this lucky homeowner.